It’s going to be a busy spring/summer for Urban Sketchers Montreal (I admit I am happily looking forward to anything with the word summer in it). In May we have Draw me a Mountain, a sketch day and exhibition on Mount Royal and now I’m happy to announce a similar event for early summer. On July 5, Urban Sketchers Montreal has been invited to a sketch day and exhibition at Stewart Hall — Pointe-Claire’s Cultural Centre situated in a gorgeous historic mansion on the shore of Lake St-Louis. It is an absolutely stunning spot to sketch, in all seasons! Together with Marc Taro Holmes, Jane Hannah and Raynald Murphy, I will be exhibiting sketchbooks and framed works from July 5 to August 30 in the Project Room of the Stewart Hall Gallery. Everyone is invited to sketch with us on that day and display sketches in a group vernissage at the end of the day. 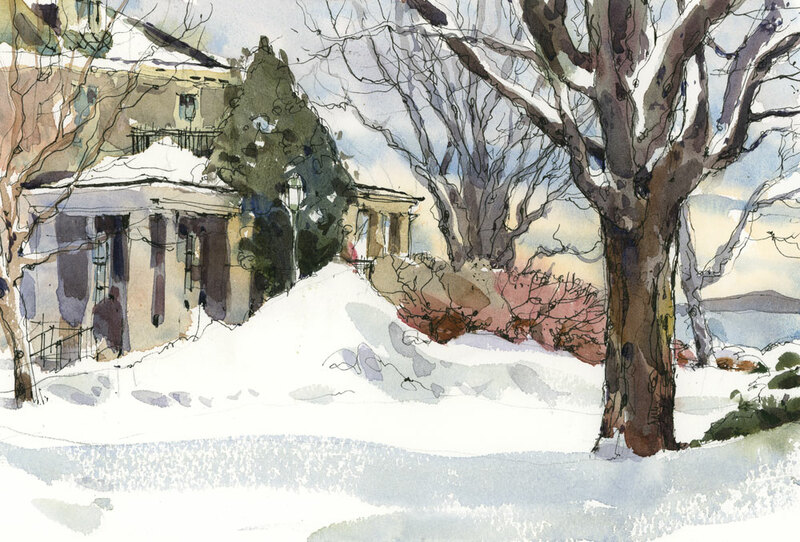 Hopefully the weather will be great, and all the snow that I sketched on the grounds this morning will be gone. More details to follow soon. Thanks so much. It was very peaceful when I painted there in the morning, and there was ice fog all over the trees. A familiar sight..You really captured it so well! I love this one – especially that tree in the foreground – absolutely beautiful! I like the drawing, the texture, the shadows, and the warmth of it in contrast to the cold snow. Bravo – another winner! Thanks so much Mary. It was a beautiful morning to paint because there was ice fog which softened my view of everything. I decided to comment on this one rather than “Farm Melt” which was very good but got too busy with all those comments. I really like these little snow scenes and particularly the modelling of the tree branches… which I should add are very different to the branches in FM. Yes, Farm Melt was really messy. You wouldn’t want to get involved in all that. I did enjoy painting the branches in both of these. I guess you don’t have too many trees that look like this in Australia, unless they are dead. Love the promise of future warmth in those shrubs.. It has been a hard winter. I LOVE this painting! I am looking forward to that too Jane.